Maximise opportunity for testing and screening to ensure that everyone in South Arica is tested for HIV and screened for TB, at least annually, and appropriately enrolled in wellness and treatment, care and support programmes. HIV self testing (HIVST), a process in which an individual performs an HIV rapid diagnostic test and interprets the result in private, is an emerging approach that is well accepted, potentially cost effective and empowering for those who may not otherwise test . This idea was first proposed in the mid 1980s. During that time there were no accurate rapid diagnostic tests (RDT) and antiretroviral drugs were not widely available. The scientific world was also trying to understand HIV infection and AIDS. In recent years, given the revised World Health Organization (WHO) recommendation for earlier treatment , evidence that effective treatment prevents onward transmission of HIV , and enduring low level of testing coverage in most settings, policy makers are turning to new testing approaches to facilitate greater uptake, earlier diagnosis, and greater access to prevention, care and treatment services. A student counselling and testing promoter during the First Thing First campaign on UL campus. The campaign at UL has been going on for more than 5 years and HIV counselling and testing (HCT) services have now been established at the campus Student Health Centre which now also stocks antiretroviral drugs, ARVs. More students tend to come for testing only during the First Things First campaign that takes place at least twice a year because there are incentives. It has been observed that, for a variety of reasons, the uptake of the HCT services by the student body is not encouraging. Only about between 2000 and 3000 out of nearly 19,000 students, mainly females, utilize the HCT services. One of the reasons that has been cited is self stigma, a belief that one is weak or damaged because of an illness, resulting in a negative attitude towards seeking or receiving the treatment. However, it has been reported that HIVST could be desirable for users concerned with stigma or confidentiality associated with existing HCT. A study was carried out among health sciences students, mainly B Pharm, B Dietetics and B Med Sciences students, to assess the potential of HIVST to increase access to and uptake of HIV testing in order to support prevention and treatment targets on campus. Data were collected during the first and part of the second semester 2015. The investigation used both deductive and inductive approaches. 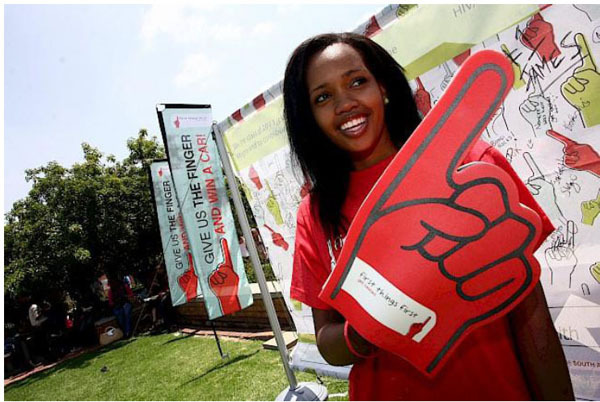 About 300 health sciences students were asked, through the social media Whatsapp, to provide a ‘yes’ or ‘no’ response to an enquiry if they knew their HIV status and if they would use HIVST and pregnancy test. This was then followed by four focus group discussions with equal number of female and male students who were at different levels of their study in health sciences, in order to achieve a range of different perspectives. The discussions took place soon after a lecture on any aspect of HIV/AIDS from which a common generic research framework was established and themes for generic interview topic guides were developed. Questions included: the level of interest in HIVST, the level of sexual activity on campus, accessibility and the use of the pregnancy test, appropriate distribution channels for the HIVST kits, how to achieve linkage to treatment and care, benefits and challenges of the HIVST. One on one discussion on the same issues was also held with the 7 staff members who included a health promoter living with HIV, at the student Health Centre which now stocks ARVs. A ‘hands on process’ was used to analyse the data during its collection by creating descriptive codes and further developing interpretive codes which were finally used to come up with explanatory codes. Using a client simulation methodology, CSM, an investigation into the sale of HIVST and pregnancy test kits was carried out on the street and at the retail pharmacies. As shown in Table 1 below the results obtained indicated that the level of willingness to use an HIVST was not the same as the willingness to use HCT services at the student Health Centre. It would appear that most of those in the first year of their study at the university, inspite of the first things first during their first semester, were not willing to undergo an HIV test in whatever form. It was surprising that most of the final year students were not at all enthusiastic about HIV/AIDS. Only an average of about 26% would utilize the HCT services. All the students at all levels were prepared to use a pregnancy test. The level of willingness to use of each one of the tests among students at different levels. The study, as shown in Table 2, found that generally, female students were largely among those who would go for an HCT. The average was about 74%. Shows gender differences in willingness to go for HCT. During the CSM some independent pharmacy outlets with a nurse, were selling the HIVST kits. The kits were not available in the big chain pharmacies. ARVs were available in all the pharmacies as prescription only medicines. Emergency contraceptive pill was also available and easily accessible from the pharmacies. Pregnancy test kits ranging in price from about US$ 2 to US$ 8 were sold in all pharmacies and on the street they were from less than US$ 1 to US$ 2. The investigation found that the kits were never out of stock. Discussions with the staff at the Student Health Centre raised a concern regarding counselling and care. They pointed out that a risk certainly existed that the user of a self test might be traumatized by the test result (self stigmatization). These issues were never raised by the students. In addition the staff mentioned that HIVST might lead to the demand for more ARVs which would not be met by the Centre that was currently getting its stock from the nearby district hospital. The Centre was getting its 3 in 1 fixed dose combination of tenofovir, emetricitabine and efavirenz. Illustrative quotations discussing the tests. "Staff at any health facility tend to be judgemental which increases my anxiety leaving me devastated and disempowered but as long as there are incentives, I do not mind"
With the advent of highly active antiretroviral therapy HAART and subsequent increased access to such treatment, the 2003 WHO/UNAIDS 3x5 initiative (treating 3 million people by 2005) would have been a resounding success had issues being raised about HIVST dealt with then. For example, self-stigmatization that is currently seen with HCT would have long been an issue of the past and the inconvenience associated with facility based HCT reduced. Students at the university indicated that they had no time for the WHO guiding principles of HCT which outline 5 Cs that must always accompany HTC: namely, consent, confidentiality, counselling, correct results and linkage to care. HIVST offered for them an opportunity for a shift in dynamics around testing session. Students indicated that the HIVST would afford them avoidance of the need for intrusive or repetitive counselling that did not meet their needs. They also said that they might decide to enrol for care and treatment at a time when personal benefit appeared to outweigh the perceived risks of accessing services. Such an action would certainly be in line with the spirit of the Patients Right Charter and the National Health Act, that both encourage people to take responsibility for their own health. Be that as it may, there is still need for addressing and accumulating more evidence on the possible uptake of counselling and testing, linkage to care and potential social harms in the context of unsupervised HIVST . The investigation on the sale of HIVST kits found that they were indeed available at some pharmacy retail outlets. Self tests for HIV should fall under the definition of a ‘medical device’ in the Medicines and Related Substances Control Act (Act 101) of 1965, as amended). It would appear that currently there is no mechanism for the registration of medical devices that exist and therefore diagnostic tests remain unregulated. The results obtained seemed to suggest that there was no current restriction on the distribution of diagnostic tests. From the CSM the only legally binding restriction on the distribution of, for example, HIVST kits were provided by the Good Pharmacy Practice (GPP) standards issued by the South African Pharmacy Council . Unfortunately the restriction, from the results obtained did not appear to be working. There is therefore a need for rethinking about the restriction in order to get evidence from those currently flouting the law and also to promote comarketing of condoms, pregnancy test and HIVST. The Department of Health launched a new scented condom for wide distribution because sexually active young people lamented that the one that was widely available did not smell ‘cool’. In other words, the quality of product was addressed after the implementation of well thought condom distribution policy and enough evidence was accumulated to deal with the smelly condom. Such a post-marketing surveillance of the HIVST kits could also be done. The study took into account students in health sciences who are supposed to be au fait with HIV/AIDS and that the results could not be generalized to other students at the University of Limpopo. However, there were a significant number of students who supported the introduction HVIST and did not seem concerned about possible risk associated with self-testing. What was interesting to note among female students was that they seemed concerned more about being pregnant than contracting HIV infection and appeared to be ready to know their HIV status. The student Health Centre seemed not to be ready for the introduction of HIVST. Their main concerns were possible self-stigmatization and increased demand of ARVs. A bigger study at the university involving students from other disciplines would shed more light on what people with high literacy level think about HIVST. Johnson C, Baggaley R, Forsythe S, et al. Realizing the potential for HIV self-testing. AIDS Behav 2014; 18(Suppl. 4): S391-5. Cohen MS, Chen YQ, McCauley M, et al. Prevention of HIV-1 infection with early antiretroviral therapy. N Engl J Med 2011; 365(6): 493-505. Govender P. Survey reveals shock teen pregnancy figures. Sunday Times 2015; 9. UN. Office of the United Nations High Commissioner for Human Rights and the Joint United Nations Programme on HIV/AIDS. Geneva: World Health Organization 2006. Kirby M. The never-ending paradoxes of HIV/AIDS and human rights Afr J Hum Rights 2004; 4(2): 163-80. Bayer R, Fairchild AL. Changing the paradigm for HIV testing-the end of exceptionalism. N Engl J Med 2006; 355(7): 647-9. South Africa. Department of Health, National Strategic Plan on HIV, STIs and TB 2007-2011. Pretoria: Department of Health 2007. South Africa. Department of Health, National Strategic Plan on HIV, STIs and TB 2007-2011. Pretoria: Department of Health 2012. Pant Pai N, Behlim T, Abrahams L, et al. Will an unsupervised self-testing strategy for HIV work in health care workers of South Africa? A cross sectional pilot feasibility study. PLoS One 2013; 8(11): e79772. The South African Pharmacy Council. Good Pharmacy Practice in South Africa. 3rd ed. Pretoria: The South African Pharmacy Council 2008.